A federal agent teams with a meteorologist to foil a US Treasury heist. Netflix have come under fire from some quarters for their refusal to release their original productions theatrically. 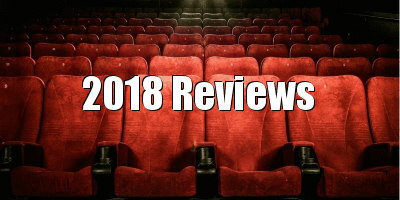 UK network Sky Cinema have now gotten in on the increasingly popular act of acquiring their own content, but unlike the American streaming giant, they seem committed to putting their productions into cinemas, regardless of quality. While Netflix assembles top Hollywood stars and beams them straight to smartphones, Sky Cinema presents The Hurricane Heist, as perfect an example of straight to video dreck as you could imagine, to the multiplex. That said, it's a lot more tolerable than most of the mega budget Hollywood action movies that now clog up cinemas. Taking its inspiration from such '80s and '90s fare as Die Hard, Hard Rain and Twister, The Hurricane Heist can't be accused of misleading advertising. It gives us a hurricane, and it gives us a heist. The heist happens in the hurricane. You get what you pay for. Eschewing muscular machismo, Rob Cohen's film offers a capable female hero in Treasury agent Casey (Taken's Maggie Grace, here displaying her own particular set of skills) and a mild mannered male sidekick in meteorologist Will (Toby Kebbell). Casey leads a team of Treasury agents on what should be a routine trip to a facility where $600 million worth of old cash is to be shredded, but her partner, Perkins (Ralph Ineson), has other ideas, taking over the facility with a gang of corrupt agents, greedy local cops and a pair of hackers (one of whom shows up to the heist wearing a cocktail dress!). 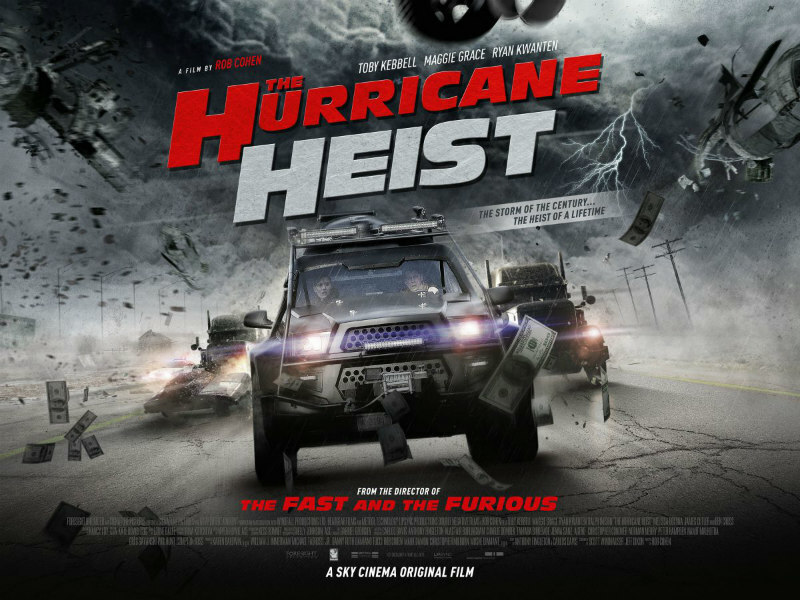 With a category five hurricane rendering the surrounding area impenetrable, there's no way for any officials to intervene, so it's up to Casey to pull off a John McClane and become the human spanner in Perkin's works, teaming up with Will, whose weather-fu and knowledge of the area gives them an advantage over the villains. Movies like The Hurricane Heist now usually show up as original productions on the SyFy channel, as Hollywood seems to think modern audiences are too sophisticated for this sort of nonsense. If that's true it's a shame, as there's a gap in the market for undemanding popcorn trash of this brand. Cohen seems in on the joke, delivering some moments that are so cheesy he couldn't possibly have rendered them with a straight face, such as how Will sees a skull face forming in the storm clouds whenever things get particularly dangerous. Grace and Kebbell prove a likeable pairing, and of course their characters are both haunted by their pasts - Casey by a bad decision that got a former partner killed, Will by the childhood memory of seeing his father swept away in a storm - because the heroes always are in these things. The gruff voiced Ineson - best known to UK audiences as a comic actor before his role in The Witch - takes to the cartoon villain role like a duck to water, and veteran baddy Ben Cross camps it up as a classic crooked redneck Sheriff. 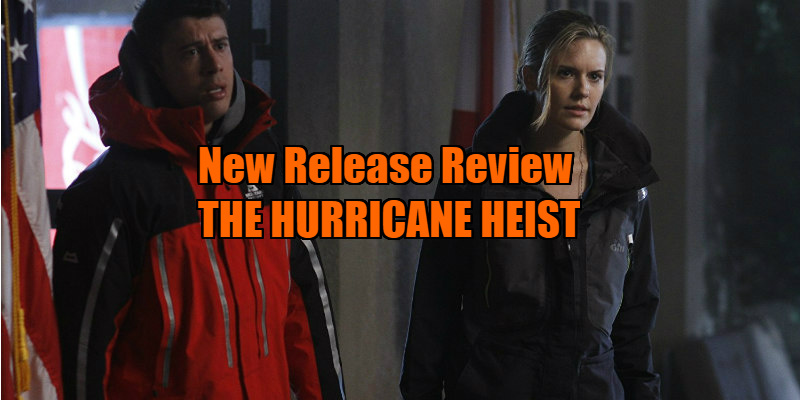 The bulk of The Hurricane Heist's audience will likely discover it while browsing at home on their set-top box, and it's arguably a movie best enjoyed from a couch, with easy access to a six-pack. You'll groan at first, but after the fourth beer kicks in, you'll be clapping as Kebbell turns hubcaps into death-frisbees and giant trucks are tossed through the air. The Hurricane Heist is in UK/ROI cinemas and on Sky Cinema April 6th.